I did this walk on Monday 5th May 08. 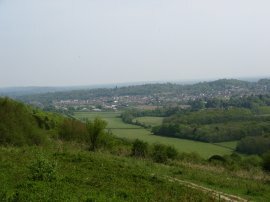 I drove to Dorking from where I took the train from Deepdene Station over to Guildford. 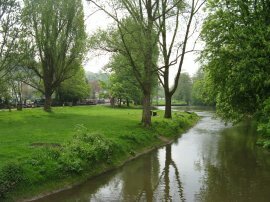 From Guildford station it was a 0.9 mile walk along the banks of the River Wey to rejoin the route of the North Downs Way. The water levels in the river part of the navigation, photo 1, were much lower than when I had walked the last stage of the North Downs Way as I made my way along the river bank back to the where I had left the path last time. Rejoining the North Downs Way the route takes a wooden footbridge over the river, photo 2, and continues ahead through some trees before crossing over a playing field to reach a road. Crossing the road the route then continues ahead up along a road called the Pilgrims Way. Here the route heads along the road, gently ascending uphill before taking a driveway off to the right at a left hand bend in the road. Passing a small parking area the route joins an unsurfaced track that continues to head gently uphill alongside the edge of Chantry Wood for some distance before passing through a more open area, photo 3, along a very sandy path. Reaching a road the route turns briefly left, and then right, to rejoin a path that runs up through trees towards the top of St Martha's Hill. 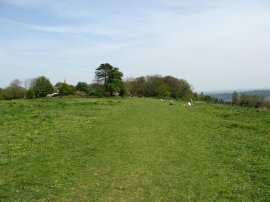 The path gradually becomes steeper as its heads up the hill over the sandy soil towards the church at the top, photo 4. The air was filled with the sound of birdsong and it was a lovely warm day with hazy sunshine and a light cooling breeze, very different from the snow I had encountered when I had last set out to walk this stage of the path just four weeks ago. From the churchyard there were fine views to the south over the Surrey Hills, photo 5. 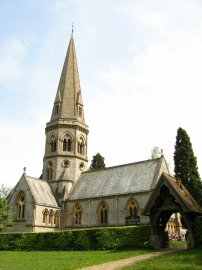 There has been a church on the site since the12th century although the current building was opened in 1850. From St Martha's church the route starts heading downhill along a sandy path that runs through the trees before turning to the left and heading down to join a route at White Lane. The route takes a footpath that runs parallel to the road over the bottom of the valley and starts ascending back uphill on the other side. 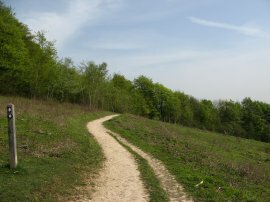 The short stretch of path marks the boundary between the sandy soil of the Greensand Ridge that route had been passing through and the chalk hills with its flinty soil that it now passes over. Where the path ends the route crosses the road and joins a track that runs through some woodland. Leaving the trees the route heads across a large open grassy area on the side of Albury Downs, photo 6. Crossing over the downs the route passes the visitors centre and café at Newlands Corner, crosses over the A25 Shere Road and joins a footpath running ahead through another patch of woodland. 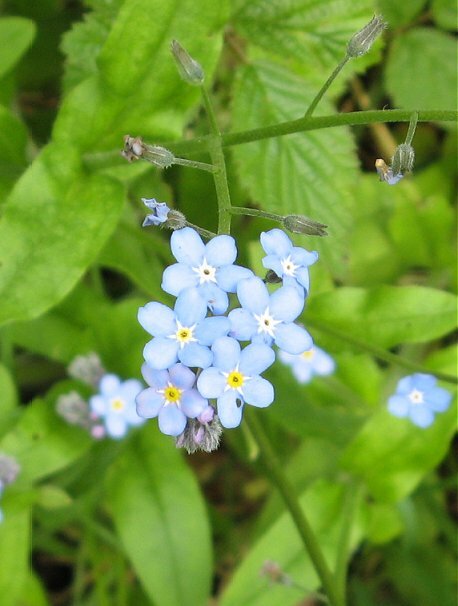 In places the air was filled with the scent of bluebells which were in full flower. 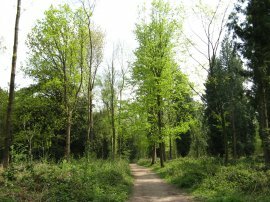 It was quite pleasant walking along through the woodland but the tall trees on either side of the path, photo 7, did mean that the views were rather limited. Whilst I was on this section of path I also spotted one of the large roman snails crossing the track although having just overtaken a couple and thier rathe rannoying dog I decided not to stop and take a photo. 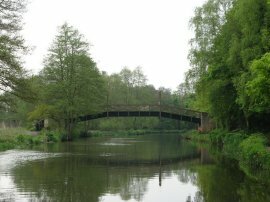 The route crosses a minor road by the Westgate Car park and continues ahead through the trees for a short distance to another road where the route turns right. Having crossed over the road the route takes a broader byway that runs down to run alongside the edge of the Netley Forestry Plantation, photo 8, along a path that was very similar to the one I had been walking down for the previous few miles. The route heads over the woodland on Netley Downs until just after the Little Kingswood viewpoint the route turns off the track I had been following through the wood and heads down to the right, at first heading slightly downhill. 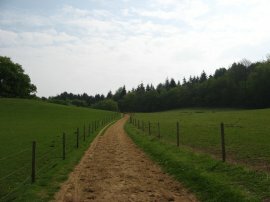 The route bends round to the left and crosses over a public byway before heading along a path running between a patch of slightly younger and lower trees. 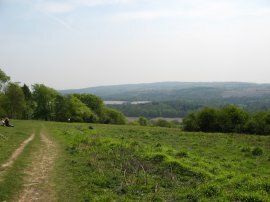 The route crosses over the open space of the National Trust Blatchford Downs reserve from where there were good views over the valley down towards Holmbury St Mary, photo 10. 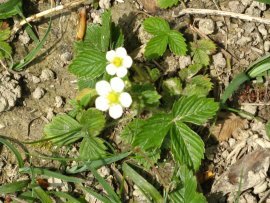 The route continues running along close to the top of the hillside, photo 11, where I spotted a number of small wild strawberry plants besides the path, photo 12. 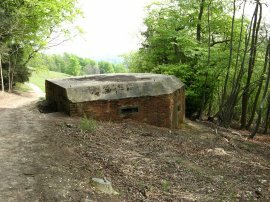 This part of the route also passes a number of old World War two pillboxes, photo 13, many now having their original views completely blocked by the trees that have grown up since they were built. 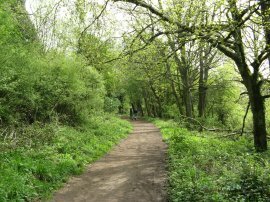 The path bends briefly to the left and then heads downhill to a road before continuing ahead along a narrower footpath, once again running through trees. then passes over the White Downs, photo 14, and White Down Leese. Turning left through a gate by another pillbox, heading gently uphill, before bearing off to the right again along a more level track along the top of the ridge. 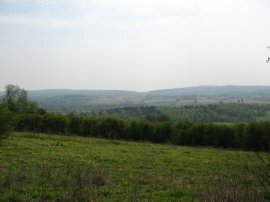 From the path it was possible to spot occasional views of Dorking to my right through the trees, photo 15. 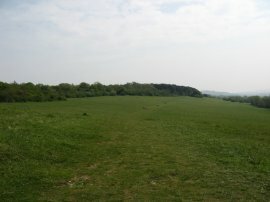 The route passes through the woodland of Ranmore Common and into Steers Field, photo 16, which is also managed by the National Trust, high on the hills above Dorking and very popular with people out for picnics in the Spring sunshine. Here the route turns to the left and heads down a road signposted Bookham. 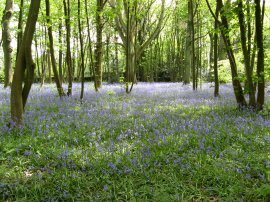 The route passes several large patches of bluebells, photo 17, and Ranmore Parish Church with its extremely tall, sturdy central spire, photo 18. 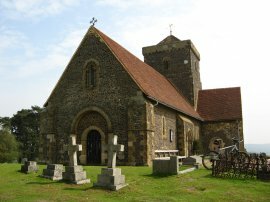 According to its signboard, this church which is dedicated to St barnabus is known as the church of the North Downs Way. At a bend in the road, by the entrance to Denbies House, the route continues ahead for a short distance along a concrete track before turning right down a path that runs downhill between paddocks and the grounds of Denbie House. Reaching another concrete track the route turns left, heading steadily downhill. 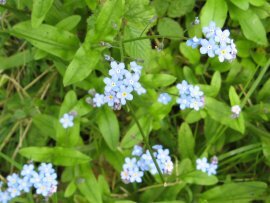 As I was walking along the the path I heard an unusual noise ahead of me and before long I was passed by a landrover pulling three trucks of people taking a tour of the Denbies Estate. A little further on the route passes through a large green gate and enters into the vineyard itself, photo 19. 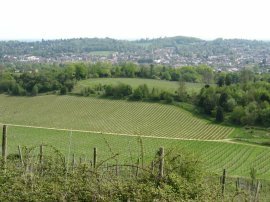 Denbies vineyard is the largest vineyard in England and produces a number of different types of wine, and on the way home I stopped and bought a couple of bottles from the shop. 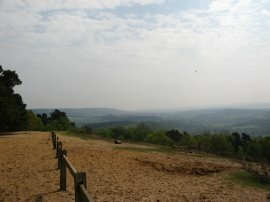 In the distance ahead I could see Boxhill, photo 20, rising high above the other side of the Mole Valley. With the temperature around 20c it seemed almost impossible that just four weeks earlier the vineyard had been covered under a blanket of snow. 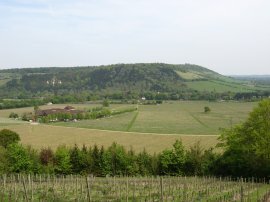 The North Downs Way winds its way around the edge of the vineyard gradually descending down to the floor of the Mole Valley. 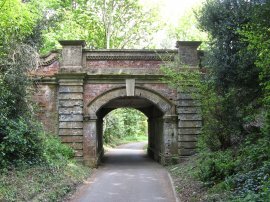 The route passes under the red brick arch, photo 24, that carries the rail lines to Leatherhead and makes its way down to reach the A24 dual carriageway. At this point I left the route and turned to my right to make the half mile walk down to Dorking Station where I had parked the car. Reaching the A24 the GPS said I had walked 11.9 miles which made it another 11 miles walked along the North Downs Way. I had previously walked the same stretch of path just over three years ago on a very gloomy and grey day and it was nice to return and complete the walk in far better weather.